When you are shopping for seafood, does it matter if it was wild caught or farmed? 1. Farmed seafood is raised in crowded and filthy conditions so it requires antibiotics and chemical pesticides to kill infestations of disease like sea lice and stay healthy. So, that means you’re eating those chemicals and antibiotics and this contributes to the development of antibiotic resistant diseases. No one wants that! 2. Seafood farms are bad for the environment. The huge amounts of waste produced contaminate the water in the areas of the farm. 3. Wild caught seafood enjoy a natural diet while farmed seafood are fed various feed mixtures which change their nutritional make up, and not for the better. For example, the Omega-3 to Omega-6 ratio of wild caught salmon is 19:1 while farmed is 2:1. 4. 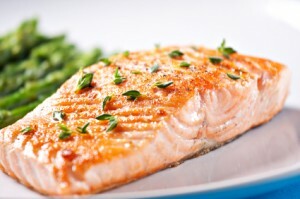 Additionally, farmed salmon are fed chemical dyes to make their flesh an appetizing shade of pink instead of the gray shade it is when farmed. This is because wild caught salmon eat a diet of krill which naturally imparts the pink shade to the flesh. When farmed, the feed doesn’t naturally impart the pink color so the farmers pick a shade from a color wheel for their salmon. So it is pretty easy to see that wild caught seafood is better for your health, the animals and the planet. If you want to learn more details about why selecting wild caught seafood is the right choice, please click here for more information. This entry was written by Jeff, posted on February 6, 2014 at 8:01 pm, filed under Blog, Education and tagged caught, seafood, wild. Bookmark the permalink. Follow any comments here with the RSS feed for this post. Both comments and trackbacks are currently closed.